Humans For Humanity is an NGO headquartered in Delhi (https://humansforhumanity.in), which was founded in 2014 by Anurag Chauhan; who began his journey of serving society and doing social work from Dehradun, at the young age of 16 years. Jalpa Hargovind Vithalani has been appointed as State Director of the NGO & has commenced the WASH initiative in Nasik in Maharashtra. Humans For Humanity is a group of concerned citizens who have come together to shelter the unsheltered, educate the underprivileged, medicate the diseased and humanise the inhumane. Menstruation comes with innumerable taboos in India, despite of preventing thousands of deaths women are victim of the taboos. 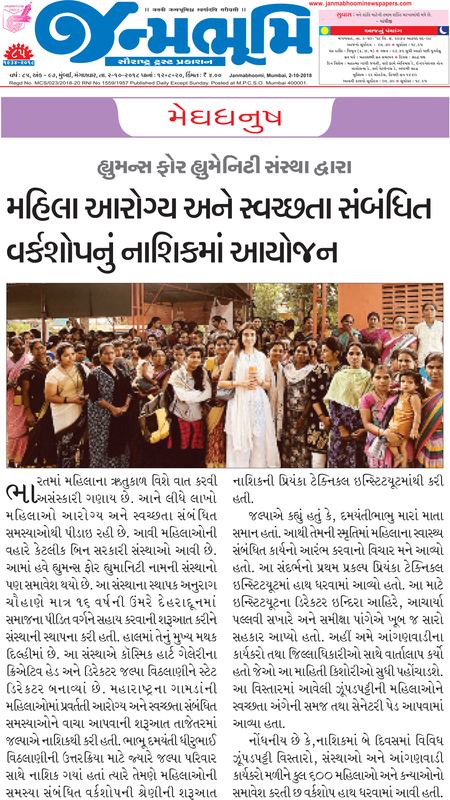 A women cannot sleep on the bed, she cannot sleep inside the house hence forced to sleep outside the house or in the animal shelter, she cannot work in the kitchen and not even touch few articles because they get impure and some people even treat them as untouchable. In this era it is shocking but the fact is it is practiced in various parts of the country! HFH provides free sanitary napkins to women, the napkins are either handmade of cotton or prepared by supporting NGO’s in India. The Organisation also provide workshops by doctors and nutritionists who explain to the women and girls the reason why menstruation takes place, hormonal changes, biological factors to make them aware of the facts. Many people in rural parts of India consider menstruation a dirty process, some think of it as a disease, all of this happens due to lack of awareness and age old taboos. The volunteers of the organization then provide a training program under which these women from slums, villages, govt. schools & colleges are taught how to make their own napkin rather than using ashes, sand, leaves, jute bags, dirty cloth, etc. “We are excited to carry this work forward in Maharashtra. The first series of workshops was in Nasik and was dedicated to my Aunt Damyanti Dhirubhai Vithalani, who has been a Mother figure to me. We lost her less than a fortnight ago and went to Nasik for the rituals. I thought there is no better time than now to launch this initiative and that too in her memory. 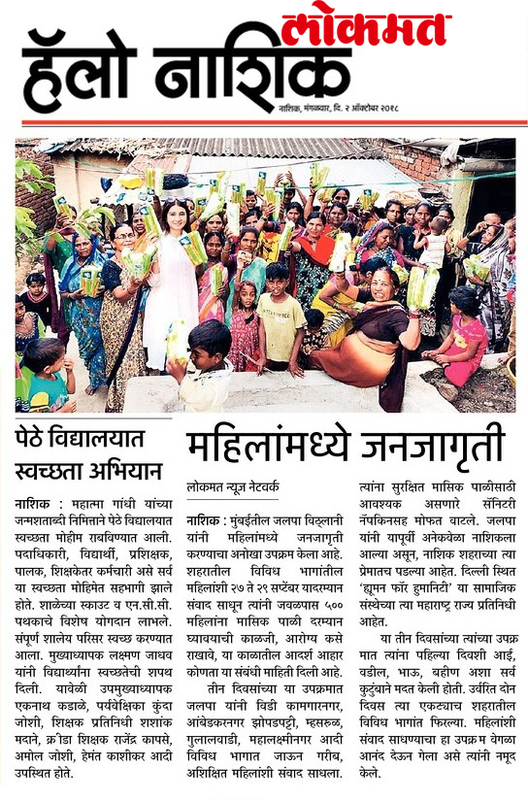 She was a compassionate lady and would be so happy to reach out and help other women.” says Jalpa Hargovind Vithalani, State Director of Maharashtra, Humans for Humanity (NGO). The response was overwhelming. Many women from the slums said that someone has visited them for the first time and they were thrilled to be educated and receive the pads. 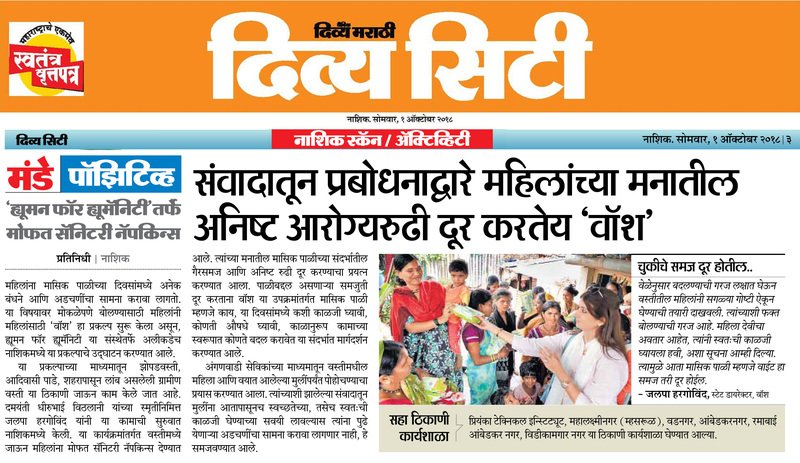 Six workshops were conducted by Jalpa Vithalani reaching out to over 600 women & girls in just 2 days, visiting various slums, local institutes & addressing Aangan wadi workers. 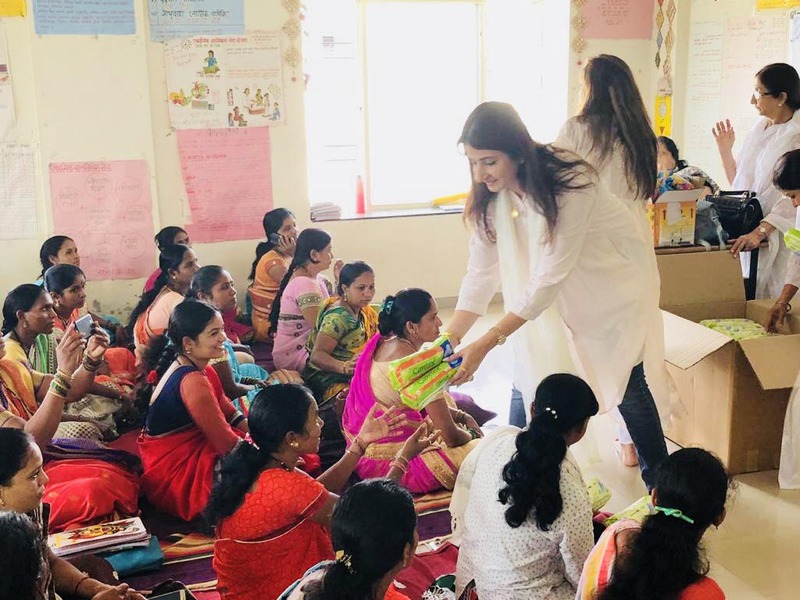 The places which were visited for the workshops included Priyanka Technical Institute, Mahalaxmi Nagar slum, Mhasrul, Nasik, Vad Nagar slum, Mhasrul, Nasik, Ambedkar Nagar slum, Mhasrul, Nashik, Gulabwadi, Ramabai Ambedkar Nagar, Nashik Road, Nashik and Vidikamgar.